Researchers from Maryland and UC Berkeley Universities have come up with an e-book prototype which could transform how next generation e-book readers are designed and used. The prototype — which you can see in the picture above — is still in the early stages of development, however the initial user reaction has been positive. The prototype e-book tries to address some of the usability issues that most e-book readers fail at – things like flipping through pages, comparing documents or folding pages. Every single e-book reader out there right now only has one screen, so the switch to dual-screen seem like a natural one. Another interesting aspect about the prototype is that it is modular in design, meaning you could connect any number of devices together to create a large reading area. The researches have also put together this video which highlights some of the features of the dual-display e-book prototype. Last month Amazon’s CEO Jeff Bezos said “the Kindle, in terms of demand, is outpacing our expectations.” Now with that kind of success it is probably reasonable to assume that Amazon is already hard at work on Kindle v2 and that competitors are also hard at work on their own Kindle-like devices. One aspect of the Kindle that many have criticized is that it lacks a stylish design, and I mostly agree. 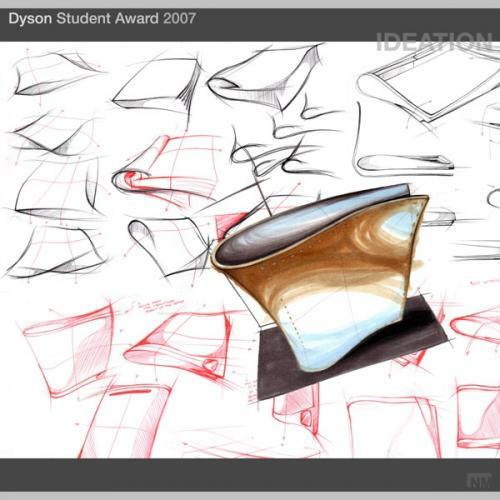 Now enter student Designer Nedzad Mujcinovic from Monash University who has come up with a beautifully designed e-book for the Dyson Australian International Design Awards which could give Amazon some food for thought. 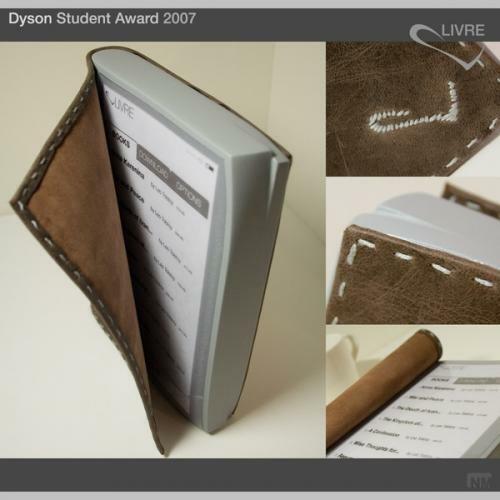 His design would use the now familiar e-ink technology, but unlike the Kindle would feature a touch screen component. This would remove the need for a keyboard instead relying on a gesture based input system. Pages can be turned by sliding your finger from one corner to the other corner and double or even triple-finger gestures will advance the book by ten and 50 pages respectively. One aspect of the Livre e-book concept I find intriguing is listed in its description – ‘The silicon body adds flexibility to excite the feel of soft cover books.‘ I love the idea of having a ‘bendy e-book’! I like the design and the idea of a multi-touch surface which would increase the reading area by removing the need for a tactile keyboard, however the design is a bit too bulky and would look a lot better if it lost half an inch in width. Overall the Livre does a better job of mimicking a book than the Kindle and the multi-touch would allow for a better user experience so it gets a thumbs up from us. As high density living puts a strain on private space, storage space tends to suffer the most. One of the items people find hard to let go of are books. To those who own a lot of books, books are much more than what meets the eye. Collections of books tend to be ones’ pride and memory on certain moments in life. When taking a dusty book of the shelf one may remember the state of mind on the first read years ago… LIVRE is a new age book, a product that addresses all of these aspects of book reading! Why does the product represent design excellence and why do you believe it deserves an Australian Design Award? This project represents excellence in design due to the fact that it fully addresses all that was set out to be achieved. The resulting product is an electronic device that is innovative in every way. It succeeds where all competitors’ products fail. It is not an electronic book reader as we know it. LIVRE is a product that takes books to the next level. LIVRE is the book of the future. LIVRE feels, looks and functions like a traditional paper book, yet it presents an evolved version using modern day electronics to further improve the experience and functionality! The traditional stitched leather cover brings the feel, tactility and smell of old style books to LIVRE. 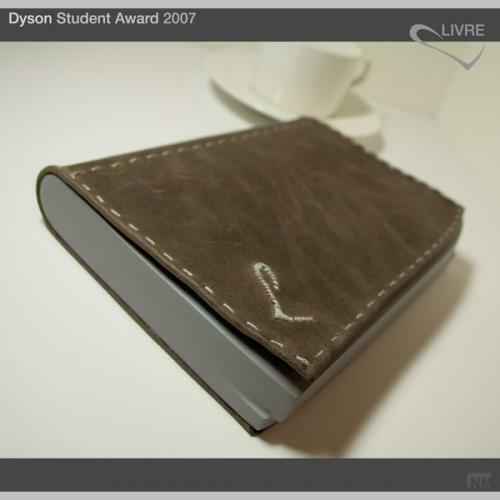 The cover dsign allows the user to make DIY covers from any material or by covers to suit a particular collection of books, ie “Harry Potter” series. The silicon body adds flexibility to excite the feel of soft cover books. Interaction happens via a thin capacitive touch screen mounted on top of an electronic paper screen (‘eINK’). Browsing pages happens by striking the screen from right bottom corner towards the centre of page to go forward or from the left hand corner to go backwards. Doing that using one finger will browse one page, two will browse ten pages and three will browse fifty pages at a time. Charging and file transfer happens via USB typeB mini port. Wireless file transfer via Bluetooth is also available. Options like changing font size and status overview are not ‘in your face’, they are rather hidden, yet accessible at user’s discretion. The aesthetic of the LIVRE was inspired by old style disintegrated books and modern sculptural movements. The general shape of the LIVRE is one that most readers of traditional books wish their books were by trying to fold and bend them for easy one handed holding. LIVRE is the book of the future!